Ranked #12 in Golf Digest Top 60 in Myrtle Beach is the Fazio Course in Barefoot Resort & Golf. Including this golf course in your Myrtle Beach golf package is a fantastic idea for a variety of reasons, including the location and of course the legendary designer, Tom Fazio. 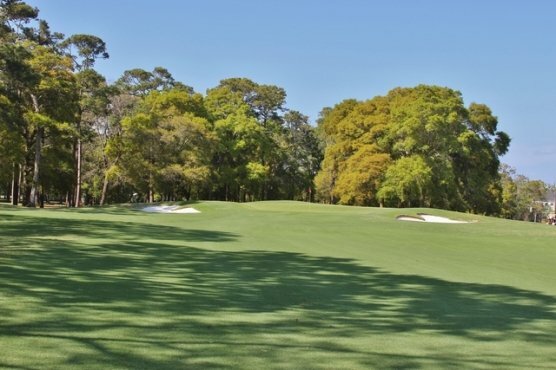 The Fazio Course at Barefoot Resort and Golf is yet another award winning design which masterfully accentuates the live oaks, pine trees, sand and native grasses along with the natural elevation changes and water features. The Fazio course is located in the Barefoot complex, which also features the Dye, Love and Norman courses. When you choose this course in your Myrtle Beach golf package, you get a par 71, 6,834 yard long European style golf course that doesn’t return to the clubhouse after nine holes. The greens are Champions Ultra Dwarf grass and the tees and fairways are GN-1 Bermuda. No matter your skill level, the Fazio course when added to your Myrtle Beach golf package will allow you to take full advantage of this Championship course that has been ranked among the best in South Carolina and #6 of among Golf Digest’s Top 50 Courses in Myrtle Beach. Of course, be sure to visit Barefoot Landing after you play this fantastic Myrtle Beach golf course. Shopping, dining, attractions and entertainment all can be found at this local area attraction. There is even a winery if you would like to include some wine sampling during your Myrtle Beach golf vacation. The Fazio golf course can be booked with the Tidewater-Barefoot-Thistle package or added to any custom Myrtle Beach golf package that you create.